Guess Who Says Obama’s Clean Power Plan Is Unconstitutional? After studying the only legal basis offered for the EPA’s proposed rule, I concluded that the agency is asserting executive power far beyond its lawful authority. Professor of constitutional law at Harvard Law School and a University Professor at Harvard University, and Obama mentor, Laurence H. Tribe. Liberal constitutional law scholar and early Obama mentor Laurence H. Tribe* recently published in the Wall Street Journal an article criticizing President Obama’s extra-constitutional attempts to regulate the electric power industry that sounded like it had been written by our colleague conservative constitutional lawyer Mark Fitzgibbons. “Frustration with congressional inaction cannot justify throwing the Constitution overboard to rescue this lawless EPA proposal—especially when the EPA itself, through Senate testimony by its administrator, Gina McCarthy, has touted its proposal as ‘an investment opportunity’ that isn’t really ‘about pollution control’ at all,” wrote President Obama’s law school mentor. For those unfamiliar with Obama’s “Clean Power Plan” its structure will be familiar to anyone who has followed Obamacare, executive amnesty or any of Obama’s other forays into extra-constitutional governance. Briefly, the Clean Power Plan would set a carbon dioxide emission target for every state, and the EPA would command each state, within roughly a year, to come up with a package of laws to meet that target. If the agency approves the package, the state would then have to impose those laws on electric utilities and the public. Perhaps the most interesting part of Tribe’s critique of Obama’s “Clean Power Plan” is his concluding reference to a 20th century clash over presidential overreach between two other Democrats; President Harry Truman and U.S. Supreme Court Associate Justice Robert H. Jackson. Obama’s complete inability to work with Congress and his commitment to an agenda that has twice been overwhelmingly rejected by voters (2010 and 2014) are situations anticipated by the Framers of the Constitution. That is why they gave the power of the purse to Congress and made Congress, not the Executive, the branch of government responsible for framing the laws governing our country. Youngstown Sheet & Tube Co. v. Sawyer is often thought of as a labor relations case (it had its beginnings in a steelworkers strike) or a property rights case in that President Truman was trying to seize private property, but as Professor Tribe reminds us the real issue at bar in Youngstown Sheet & Tube – and in the many controversies President Obama’s extra-constitutional acts have generated – is not about the ends government is trying to achieve, but the means by which those ends are achieved. 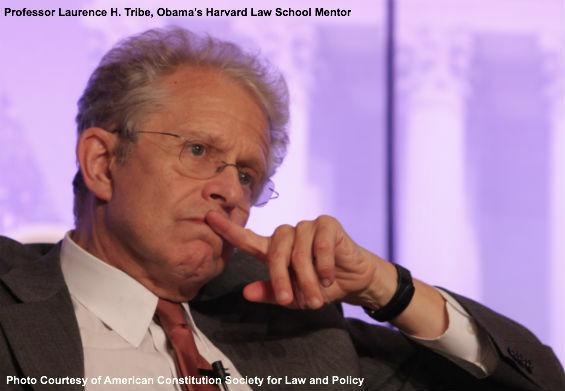 *For more on the relationship between Laurence Tribe and Barack Obama see “Tribe’s Opinion That ‘EPA’s Clean Power Plan Is Unconstitutional’ Means More Than You Think” by Ron Arnold, executive vice president of the Center for the Defense of Free Enterprise.